More Articles Box (More Stories) appears when a user scrolls on a single post at least 400px. The box appears in the right bottom corner and it can show one or more posts related to the current one. To learn more about this function please read below. 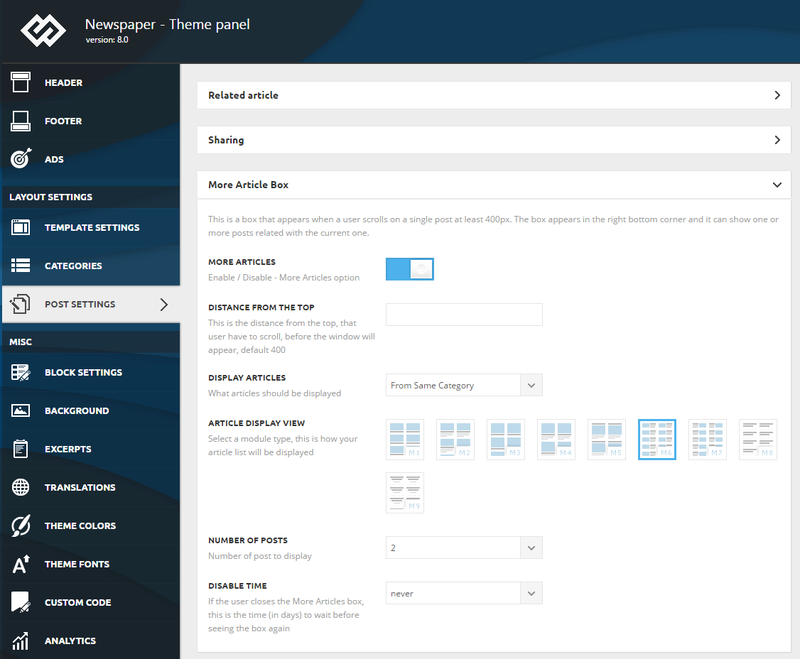 To enable this feature go to Theme panel > Post Settings > More Article Box section. Click to enable the More Articles option and Save Settings. After you finished customizing this section please click on the Save Setting button. Welcome to the Community! This is our main Support Center and, also the place where you can make new friends, people just as passionate about websites as you are. Don’t hesitate to ask for help as we are here for you. Thank you for buying our products!